Over the years, I’ve see a couple of questions repeatedly on the Selenium boards related to HTTP status codes: How do I check for broken links (404s)? How can I check the status code of a web-service request made from my web-app? The answer is usually “Selenium can not do that” because, of course, Selenium is a browser automation tool – not a full-featured testing solution. Other answers suggest various solutions…none that I’ve seen are elegant. This problem came to my mind last week as I was considering a task that will require writing a browser extension to solve a different, but related, problem. That extension will need to solve a much larger problem, so I was looking for ways to break down the solution into something smaller and more manageable while I learned about building and deploying browser extensions. This seemed like a perfect fit. So I set out to solve the problem of getting status codes from HTTP transactions that the browser has issued, during a Selenium test. Within the Gateway library there are two classes that the unit test interact with: the ExtensionConnection and the UrlStatusCounter. Note that the extension path must reference the extension file (.xpi). You can download it from the GitHub releases page for the project (see resources section at the end). I suggest keeping it with the driver implementation executables (i.e. geckodriver.exe, etc). To be clear, the extension is NOT installed via the Mozilla Add-ons site. The MeddlerGateway is part of a Java library that must be included in your (Java/Selenium) unit test project. It serves as the bridge between the Meddler extension and the Java unit test code. It runs behind the scenes – it is started automatically when it is first needed and runs until the JVM terminates. It runs a simple web server (on port 8411 by default) that listens for a websocket connection from the extension. 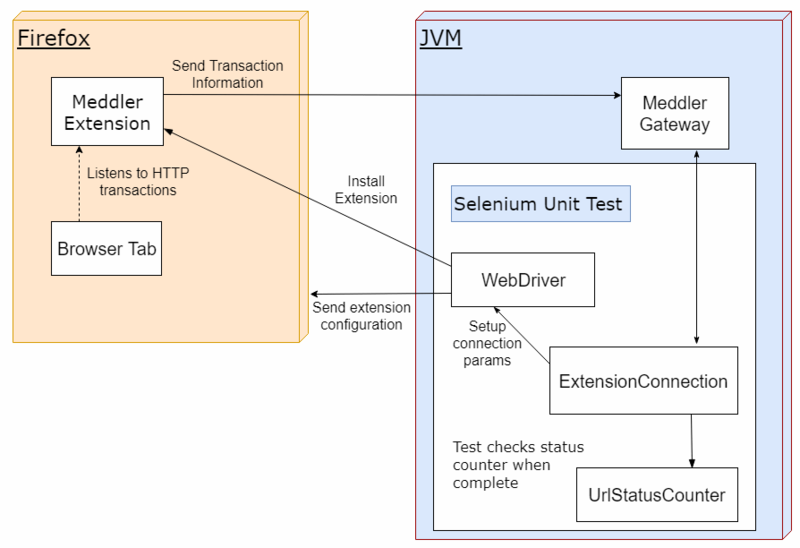 Lets put it all together into a Selenium unit test. I am going to show the simplest example: I have a bunch of JUnit tests that are checking various bits of an application with Selenium/WebDriver and I want to look for any 404s on the pages…and fail the test if they are found. First, the setup method needs to establish the connection to the extension (see the ‘>>>’ lines). And then setup the UrlStatusCounter. The setup of the driver is hidden inside the DriverSetup.firefox() method, which is used in many of my unit tests. This one line adds the extension into the Firefox profile so it is available in all of my tests. Note that the EXTENSION_PATH should point to the extension bundle (XPI file). You will need to download this file – see the resources section at the end for a link. For this use case, there is no need to add any code to my individual tests. Here is an example test with a URL that always includes a 404. Adding one line to the teardown method will fail the test if any 404s were found. The error message will include a list of the URLs that returned a 404. With just 3 lines of code (per test file), you can check for 404s during every test in your Selenium test suite. Plus 1-4 lines in your browser setup. If your tests already share the browser setup and use profile, you can get by with just 4 lines total! If you have questions, please open an issue on one of the GitHub projects (see below). Or use our contact form to talk with us about your Selenium test automation challenges. The Java library (.jar) for the MeddlerGateway can be downloaded from the releases page of the MeddlerGateway project on GitHub. The Meddler Extension binary (.xpi) can be downloaded from the releases page of the MeddlerExtension project on GitHub.